What is Pay per Click (PPC) Advertising? What are the Benefits of PPC? What are Google Search Ads? What is Google Ads Credit? Where can I get Google Ads Credit? So you've been running Google Ads for a while, but you notice (or worse your boss notices) that your costs has started to creep up, seemingly for no reason. So how do you reduce AdWords spend whilst maintaining quality traffic? You may be thinking what's going to change since I set it up? Well plenty, and many of these things may not necessarily be within your control. New competitors with similar products or services may enter your space, your keywords may be left behind as new search terms trends surface and of course Google likes to keep us on our toes with changes to the way things are done, particularly around spend. “Google 'can' spend up to 2 times your campaign's daily budget to show your ads on certain days of the week or certain times of the month based on fluctuations in traffic – but not more than you spend on your campaigns each month." 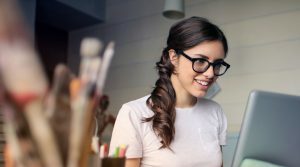 This new approach may or may not be ok for you, depending on your campaign strategy and how actively you manage your account. Once you have an understanding of what can happen in spend it's time to review how you can impact it, positively. The underlying theme to this post and the biggest opportunity to reduce AdWords spend undoubtedly comes from actively managing your Google Ads account. i.e. regularly reviewing it's performance. But how often is regularly? We'd suggest at least weekly to start with, then monthly (at a minimum) when you are happy you have eliminated the the largest cash black holes. This is our number one tip, as if you don't check how your campaigns are performing you may not realise how much you are spending and on what until it is TOO LATE! Make time to check your total spend and make sure that you are spending most in the areas that make you most money or help you to achieve your main goals. At the end of the day you want to be throwing money away because you have too much not due to waste.. Monitoring your keywords and quality scores at regular intervals, is also a good habit. Try weekly initially until your campaign is nicely tuned to a level you are happy with. Following this, an hour spent once a month is time well spent. Tip: Remember making one change at a time will help you to see the impact of the individual changes. This is a biggie! Google is continually driving towards improved ad relevance. They want to make sure that people are seeing ads that most relate to their searches. The way Google does this is by giving advertiser's keywords a Quality Score, influenced by 3 factors: Expected CTR, Landing Page Experience and Ad Relevance. And how does this relate to spend? 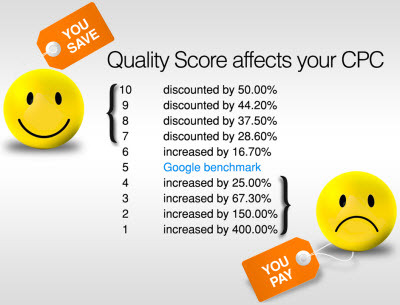 The amount you pay for your clicks is directly influenced by Keyword Quality Score as shown here by Wordstream. "Measures how closely related your keyword is to your ads" (Google) so ensuring your keywords or phrases are mentioned exactly in your ad copy can immediately improve your Ad Relevance. Explains "how relevant and useful your website's landing page will be to people who click your ad" (Google). Landing pages that mention your keywords including in titles and headers as well as in the main copy will score better. If this status is showing as 'below average' then your website might need a few amends. It is vital to ensure that you have included negative keywords in your campaign, as without them you can waste your budget very quickly. Negative Keywords allow you to exclude certain terms in searches for which your ad(s) will show. You may want to consider words that are commonly linked to a word in your product name but which is irrelevant to your particular product. For example you may sell dog collars for pets but may want to exclude “vicar”. Competitor terms may also be worth adding as a negative and consider jobseeking or advice seeking search terms e.g. "jobs", "how can" - unless of course these are part of what you are advertising! There are two approaches to adding negative keywords: firstly re-actively by checking your search terms regularly (as in the screenshot above) and adding terms that are unrelated to your products/services to your negative keyword list(s). Tip: Negative Keyword lists can be added to share across multiple campaigns, saving you time editing individual ad groups. Add as usual but tick the Save to new or existing list box. You can add negative keywords at either ad group or campaign level, individually or as lists. Occasionally when setting up a new campaign, for some settings you may think I'll come back to that later, when I have some data. This can be a good strategy but do remember to go back and review your data and make the appropriate changes. Making sure your ads are only showing when it's most appropriate, is key. Whether this is when your business is open, when you are able to respond or answer the phone or simply when people are likely to search, having the right scheduling in place can immediately reduce unwanted clicks and save your budget. If you have no schedule in place, using the dimensions tab, take a look at your results by day of week and hour of day to see when your ad is impressing most (and therefore being searched for most). You can then add a schedule to suit your needs. Once you have added schedules, you can choose to bid up or down during certain periods of the day or on certain days, using bid adjustments. For location if you only want to target a specific area, make sure this has been selected. You can choose to add towns, cities, counties or countries. You can also, by selecting 'nearby', choose to target a radius around a certain location e.g. within 10 miles of Coventry. Another consideration here is whether you would like to target people who are physically located in the location or those searching for the location, this can be specified in Location Options (advanced). For some campaigns you may want to target specific device types, you can choose from Computers (including Desktops & Laptops), Tablet or Mobile. For example you might be asking people to complete a lengthy form - this can be very fiddly on mobile so you can adjust bids down for this device type. Or you may want to target people specifically when they are on the move so should increase bids for mobile and decrease for Computers. This targeting will help to ensure you won't waste money on the 'wrong' clicks. A click itself is unlikely to be the objective of your campaign. Knowing what happens after the click; Did they buy your product? Did they download your app? Did they complete your form? - is essential in ascertaining which clicks you want more of and which are not relevant. These actions are referred to as "Conversions" - you can choose to track conversions from different sources: your website, app, phone calls or imported data (e.g. offline sales). For website and some apps this involves adding a snippet of code or tracking tag which tells Google when a specified action has taken place. For calls from call extensions or call only ads and for apps in Google Play this is done automatically. Once your conversion tracking is set up this can be reviewed easily at all levels by adding the conversions column to your table view. This data can then be used to decide which keywords or ads or time or location, etc to bid more or less for. By the time you have worked through these 5 tips to reduce your AdWords spend you should not only have saved a bunch of cash but also become a lot more familiar with the inner workings of Google Ads. Now it's up to you to keep your wasted spend down. Remember tip number one! Want to discuss this Guide? Posted in Articles, Guides and tagged adwords, ppc, tips, tuning. Welcome to NetConnective. We are a Google Partner and a leading provider of Digital Marketing and Pay per Click Advertising services to businesses across Hampshire, Berkshire & Surrey. 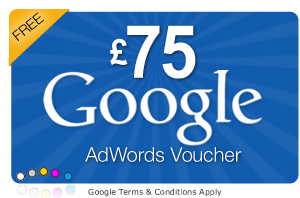 Google provides it’s Partners with promotional voucher codes that offer Free Credit to Google Ads users. Google display ads, typically images or animations that appear on over two million websites and in over 650,000 apps allowing you to target specific groups, demographics or behaviours of users. Which ads are shown is the result of a realtime auction based on the amount the advertiser is willing to pay to display their ad, compared to other bidders. Advertisers typically only get charged when a searcher actually clicks on their ad. As a registered Google Partner we sometimes have access to Google Ads credit vouchers that we can distribute to people looking to setup on Google Ads. Whilst we normally have a bunch of codes to send out Google have recently introduced new restrictions on the distribution of these codes over a quarterly basis. If you complete the form on this page and we have codes available you will receive one (see exclusions) or alternatively if we don’t have any available continue to register your interest and we’ll be in contact when Google make more codes available to us. Shopping ads are more than just a text ad–they show users a photo of your product, plus a title, price, store name, and more. Use shopping campaigns to promote your online and local inventory, boost traffic to your website or local store, and find better qualified leads. To ensure timely delivery of your voucher code we ask that you provide a work email address that is actively monitored for us to send it to. Note this work email address does not have to be associated with your Google AdWords account in any way, it is required purely for us to send you your code.